I was getting over my Post Carnival Depression (PCD) and DJ Private Ryan made me digress. 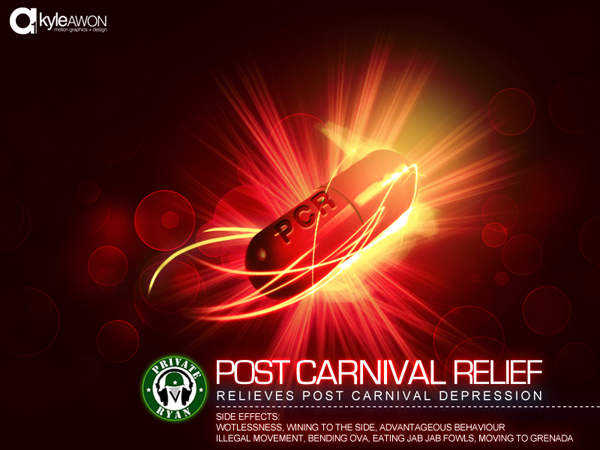 He claim say this mix will RELIEVE PCD... so why am I looking for my costume to put on and have a wuk up session in my bedroom right now???? LOL! This mix is HOT!!! Took me right back to Girl Power, Eclipze, Lara, and playing mas on Monday and Tuesday in Trinidad. I love that he included songs from other islands. This soca mix will hold me until he puts out his 2012 Pre-Carnival Mix .